The Kyocera ECOSYS M2735dw is an affordable monochrome laser printer that incorporates a copy, fax and scan function. For a household, home office or small business, this printer is a great low-budget option and is straightforward to operate even for inexperienced users. The virtually silent operation means that this Kyocera M2735dw is suitable for use in a home office or small business environment with no need for a separate printer room. However, this machine is a monochrome printer only and is not ideal for a home or business needing to print photographs and graphics. Measuring just 417 x 412 x 437mm, the Kyocera ECOSYS M2735dw is a compact machine in a grey and black design that blends in with the colour scheme of most business places. Connection is achieved via USB, wireless and network interface. To check the printer’s status and navigate the printer, use the control panel’s 4.3-inch touchscreen, which makes it easy to access advanced options. The 250-sheet universal cassette and 100-sheet multi-purpose tray give flexible printing options, and the paper storage capacity can be increased if necessary. The print speed is 35ppm, and the resolution is 1200dpi. The monthly duty cycle is 20,000 pages. 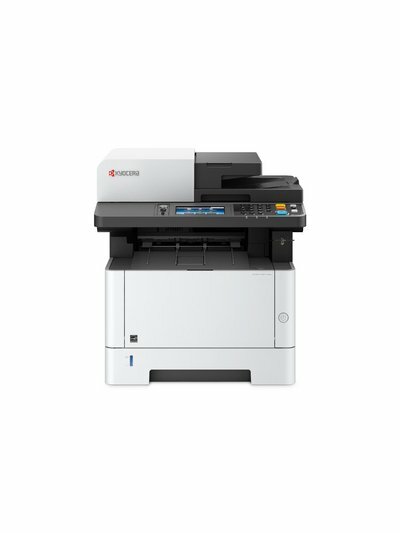 The Kyocera ECOSYS M2735dw is a reasonably-priced machine with features that are usually found on more expensive options. With a compact footprint and virtually-silent operation, it can be placed anywhere in the home or office without disturbance or taking up too much space. Energy-saving features and low running costs mean that it is ideal for the budget and environmentally conscious. It prints double-sided as standard. The Kyocera ECOSYS M2735dw is a monochrome printer and is unsuitable for anyone needing to print in colour. Increasing the paper capacity requires the purchase of further trays, which should be factored into the budget before purchasing.